Fifa 15 is the latest offering in the series from EA Sports and as with every new release it’s jam packed full of new features. There are lots of new animations, including new celebrations such as the “Flag Slap” and even a new Top 10 list of Players. It can be extremely frustrating to turn free kicks into goals, and loads of your hard earned time can be spent trying to learn how without much progress. Its for this exact reason that we’ve gone out of our way to compile this Fifa 15 how to score freekicks tutorial. The Dipping Free Kick is the most effective free kick method in FIFA 15, and this is simply because you will use it much more than the others. It should be taken from relatively close range and closer to the center of the box than not, don’t use this if you’re nearing 30 yards out. First, you need to select a kick taker that has high Curve and Free Kick Accuracy stats, you can see this by holding down the left trigger during the free kick screen. Power is not such a big deal when it comes to the dipping free kick, and in some cases, less power is better as it has more time to dip. Left Footer Aim between the 2nd and 3rd players from the right of the wall. Aim just between the heads of the 1st and 2nd players from the left of the wall. Right Footer Aim just between the heads of the 1st and 2nd players from the right of the wall. Aim between the 2nd and 3rd players from the left of the wall. Finally, charge the power bar up to about just before the yellow, or around the beginning of the yellow if it’s closer to 25 yards. You’re aiming for it to drop into the bottom corner, so it doesn’t need a whole lot. Last, as you shoot the ball, hold up on the left analog stick to apply dip. Try to make it go straight up so you get some nice downward curl. If everything else is done correctly, this should be the easiest part and your shot will drop nicely out of reach of the keeper. If you’re really close to the goal, you can try a Second Player Free Kick. You can only do this if the preferred foot of the player corresponds to the side of the goal that the wall is blocking. For example, Van Persie, a left footer, can do this well if the wall is blocking the right side of the goal, and the keeper is leaving it open. This way, he can just curl it around the wall, but it wouldn’t work so well if he tried to curl it left around a wall blocking the right side of the goal. For some reason, using a second player seems to generate more curl from this region, so be sure to select your second player with the Left Trigger before you shoot. So, aiming is pretty self explanatory. We’re aiming to curl the ball around the wall (inside to out), so aim just to the side of it and curl around. You’re not going to use a lot of power, but since we’re so close here it heavily varies from player to player. Usually, the same amount of power you used in the Dipping Free Kick is sufficient (about to the yellow). Last, you need to apply curve to get it to the far corner. It doesn’t even need to curve all that much because it will probably be so powerful that the keeper is unable to reach it and even if he does he only pushes it off to the side a little bit. Free Kick is important in FIFA 15 Coins if you want to perform an effective attack in a match. 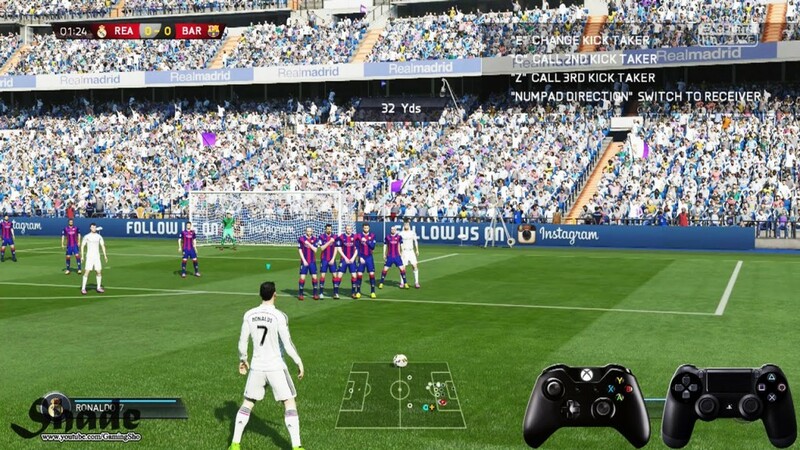 And you can use Free Kick to win your game and get FIFA 15 coins just in the situation that when your player is countering and you’re waiting for your players to catch up. This entry was posted in FIFA 15. Tags: fifa 15 coins, fifa 15 guides.